Back in 1990, Indonesia rock scene was anticipating for the debut album of Grass Rock, a popular rock band from Surabaya, which had been known for their excellent musicianship, featuring the likea of Eddie Kemput on guitar and Rere on drums. 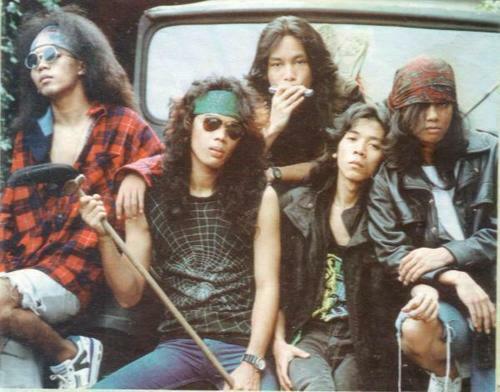 While their debut album with “Peterson” was relatively successful, it was the other band from Jakarta, Slank, who spoilt Grass Rock’s party. With their badly-named debut album “Suit Suit He He” which surprised everybody with their fresh take of rock ‘n roll music combined with honest, straight-forward, no “nonsense” lyrics. Their debut album sold in gold, their songs “Maafkan”, “Memang” and “Ladies Night in Ebony” became hits, and their free-spirit attitude resonate with million of young crowd who eagerly came to their concerts. The rest is history. Thanks to Apple Music to feature this Indonesian legendary rock band with their remastered albums in the digital collection. Rock!